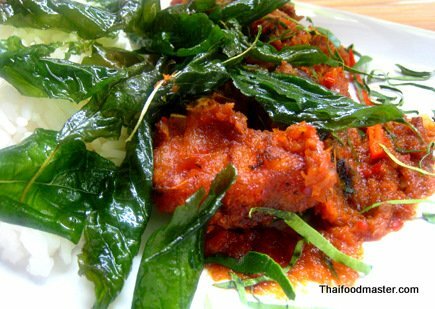 Wonderful spicy nam tok recipe; crispy fried fish dressed with plenty of fresh herbs, chilies, limejuice and ground roasted rice. 1/3 cup mint leaves, hand torn into halves. Clean the fish. Remove the backbone and back fins. Score the body with diagonal cuts to allow even cooking. Deep-fry the fish on medium heat until golden and crispy from the outside. Set aside. If the fish is too large to be submerged in the oil, you can use a spatula to wash the exposed areas with hot oil. Be very careful. Hot oil is extremely dangerous! In a mixing bowl mix all the dressing ingredients in the order they are listed here. 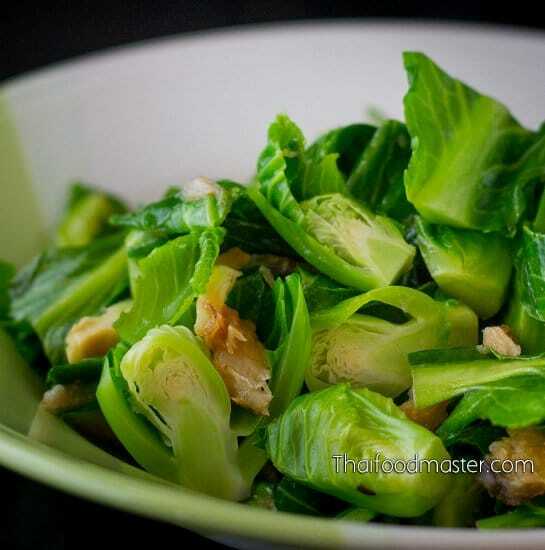 Arrange lettuce leaves on a large serving plate. 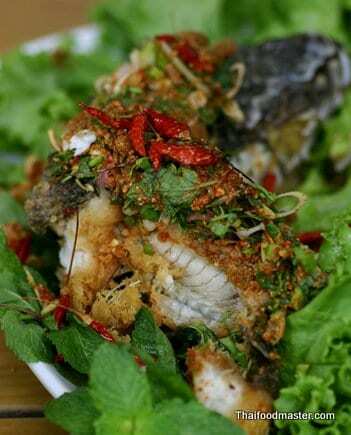 Place the deep-fried fish on top and pour the herbs dressing mixture over the fish. 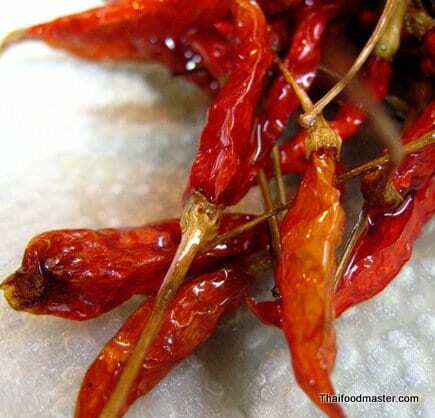 Decorate with fresh mint leaves and fried dried bird's eye chilies. 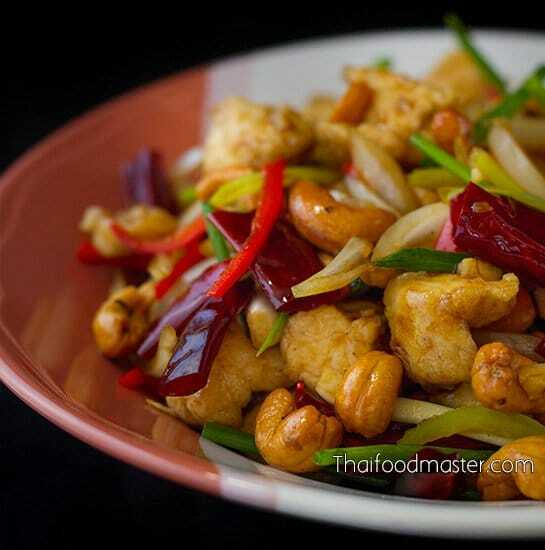 Serve with hot sticky rice. Hmmmm What a yummy food!!! 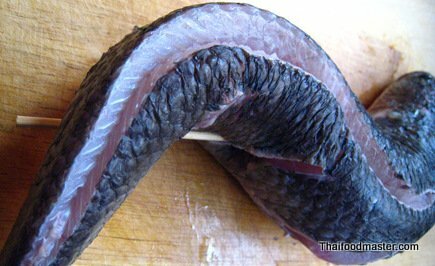 I have no more Pla Duk in my freezer…What a jelious that you have such a fresh fish there ;) Thanks for sharing ka!!! Wow, we just ate this for dinner. We used tilapia filets. Eating it, we thought we were back in Thailand at a fancy restaurant. Keep the good recipes coming!!! Love this suggestion. I have a whole fried tilapia and will definitely try this over it. Thank you. Just stumbled onto your site while I was looking for a PaLo recipe. Will have to try that next. Love your site – especially because you use English and Thai script. 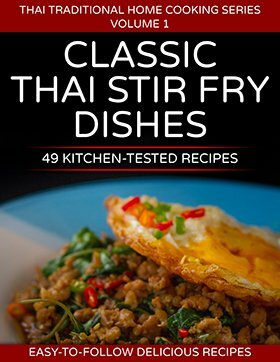 I am an Australian in Tokyo and am putting together a dictionary of Thai food ingredients in English, Thai and Japanese and think your site would be very useful. 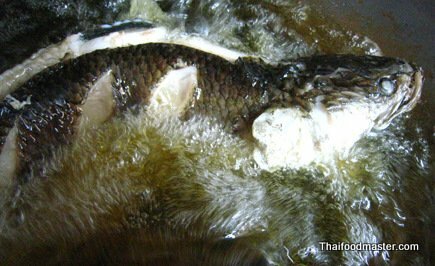 I’m trying to find a fish recipe I ate in Mae Hong Son along the lake. It was a grilled fish topped with a lime/chili sauce. I’m wondering if you have any recipe’s from the area? Thanks! So good to see new posts on your site. You understand food and come from the heart in the way you cook. The time and effort that you take to present and post is greatly appreciated. Have tried a few of your recipes and really do enjoy your approach, thoroughness and obvious love of what you’re doing. 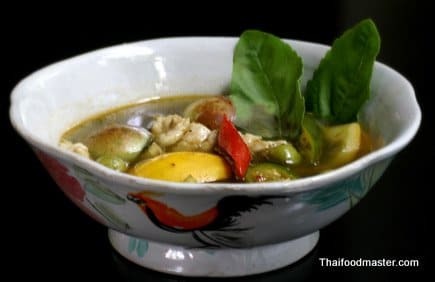 With respect to this particular recipe, i can only refer to my childhood in Thailand (50 years ago). At that time, in our household and most others, fried food was the exception, not the rule. 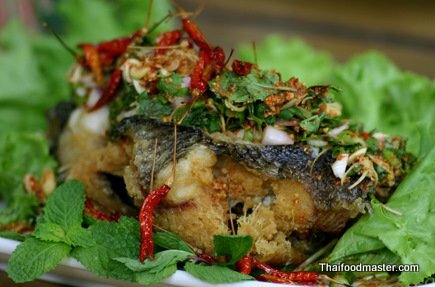 Really, i think that this dish was, in the past anyway, done with charcol grilled fish ปลาดุก. The slightly smokey aroma and taste of a slow-grilled fish works well with the sauce. 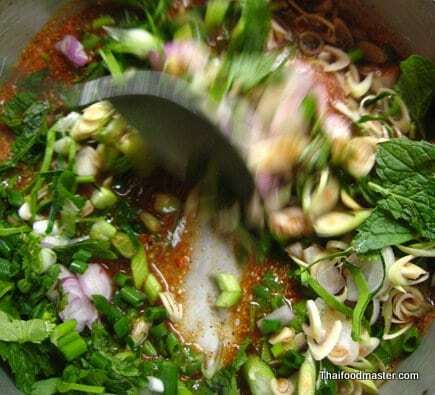 Wow……cooked a lot Thai Dishes and Herbst and “Saucen”.. in my life. But this receipt surely is heavenly. Never used so much herbs in one sauce. Itś fantastic !!!! All your senses are beeing occupied. It look so good !!! What can I do instead of frying the fish? hi haya ; try preparing the sauce first, then you can opt to other proteins or cooking styles.